It is my second week of inpatient hospitalization through the Michigan Headache and Neurological Institute (MHNI). http://www.mhni.com/ I have daily, refractory migraines, which just keep getting worse. They have affected my family life, my work in a big way, decreased my circle of friends, changed my retirement plans and much more. Migraine runs in the family, and unfortunately, I've passed this nasty disease on to my (now) 35-year-old son. The hospital was a huge step for me. I've never been in one except to birth my 2 children, and that is, of course, quite different. One of the many things that finally drove me to MHNI was that I began to realize I could no longer deal with numbers, a side effect of some medications. I couldn't make change, add my hours correctly on my request-for-leave form, not to mention subtract, multiply or divide. I became afraid that my teaching skills were slipping and it was, therefore, affecting my students and their learning. Morning comes early in any hospital. A lab tech shows up to draw blood as I surface into semi- consciousness. It is 5:00 am. She leaves, and Peggy, my night nurse, plugs the IV tube into my arm to start my morning protocol of meds, which takes 45 min. to an hour. By 7:00, breakfast arrives, and I'm told to eat up and get ready for morning rounds. To hell with food. I can eat later. I throw on my clothes and go to the kitchen to make my cup of tea. I drink coffee, but that's it's not readily apparent that's in the cup on my tray. I like my morning brew dark and strong. I hustle to the green room and chat with a couple of folks from New York, Maya and her father Avi, who is a very funny man. He begins a long story about their cab ride to the hospital. Maya rolls her eyes. I never do hear the end of the story as my name is called and I enter the conference room for morning rounds. There must be 15 or more people in the room including neurologist Dr. Saper, who established the program in 1978, more docs, physician assistants (PA's), nurses, psychologists, physical therapist, nutritionist, activity therapist, and more. Dr. Saper tells a story, asks questions, goes over my progress so far, asks if I have any questions. (I always do.) Then he changes course on my medications, and there is some discussion. After about 10 minutes, I leave; the team has another brief discussion about and without me. Then the next person is called. This recent stay at the hospital in Michigan was so intense and otherworldly for me that, so far, I have completed 2 small drawings and two large collages, a new medium for me. Before I left the hospital on May 4th, I saved and then packed all the miscellaneous papers generated by MHNI and the hospital. My roommate, Kathy, was puzzled. "Why are you carting all this stuff home? But I knew that what I had was the raw material for art that was already in process in my imagination. Art lets me get it all down - and out. Migraine is a difficult, lonely disease, but once I spend the thought, time and energy to put it all together in a new work, I can move on to the rest of my life with more ease. I like maps. 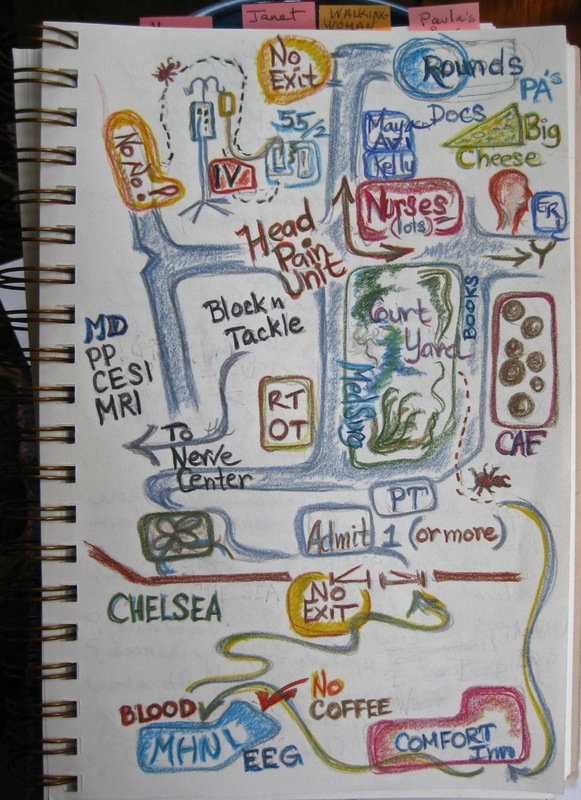 The first little drawing I did was "Journey Map." 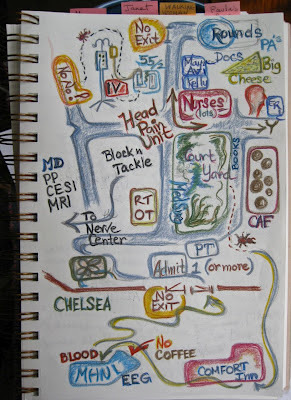 It is based roughly on my room 55, bed 2, the Head Pain Unit and other immediate areas I had access to in the hospital. It was fun recreating the schematic in my head and getting it down on paper, a sort of coloring project, which helped bring out the kid in me - usually a good thing. I've had migraines for as long as I can member. They started in childhood and have gotten worse over the years especially since pregnancy with my second child. 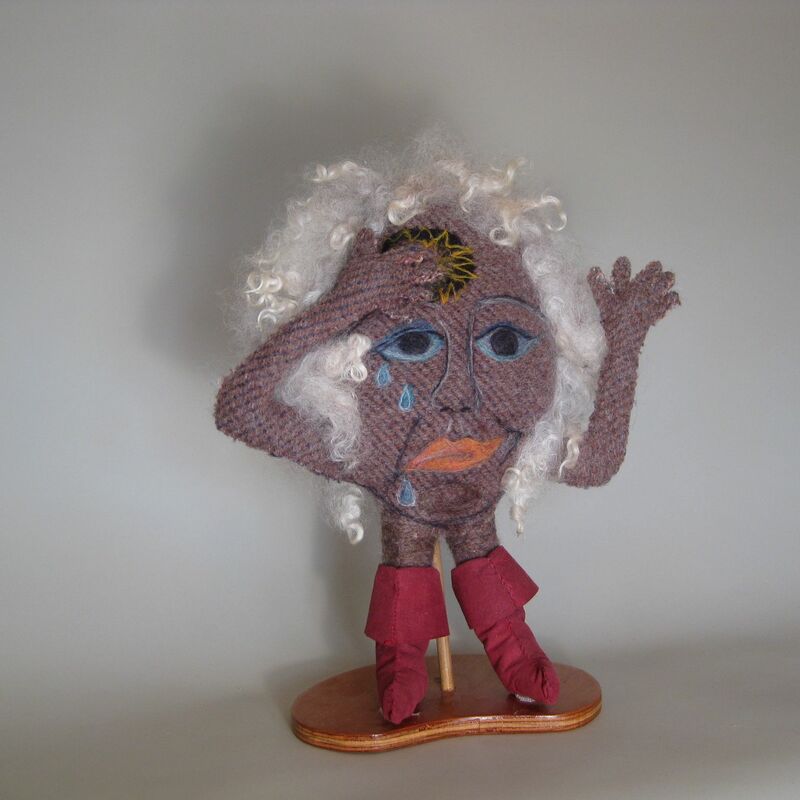 They say that migraines tend to fade away as you get older, after menopause. Not mine. They just got worse. Now I'm on a variety of preventative medications with a variety of desirable and undesirable side effects which partially control my headaches. I just returned a month ago from an inpatient hospitalization through the Michigan Headache and Neurological Institute. More later about that. I now recognize what I have resisted for many years: I have migraine (I knew that) disease, which is a difficult, lonely chronic disorder. What I also have grown to recognize over the years is that having chronic migraines has contributed to the development of art as a central to my life. As Terry Tempest Williams (and probably others) said, "It is not optional." It is a strategy for survival. The title of this piece is La Migraña. She is, of course, me. The boots are "Seven League Boots." They come from a dream I had in which I was wearing seven league boots. They also come from English fairy tales where a tiny guy steals magic boots from an ogre. They allow him to leap mountains in giant strides. Here they give me a real sense of power in spite of or maybe because of migraine.